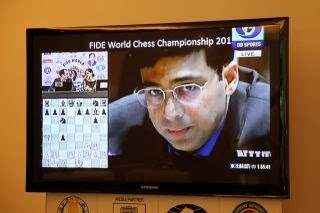 Anand - Carlsen World Chess Match TV Viewership: Between 100 and 200 million! The FIDE World Chess Championship between Magnus Carlsen and Viswanathan Anand is scoring possibly the highest viewership and readership numbers for chess in history. Up to Round 8, the viewers numbered 200 million and 500 million. Television coverage could be estimated most accurately. More than 100 million people are following the match every day in India and Norway on TV, and additional estimated 100 million have been reached through TV news reports around the world. India 80-100M daily: The India fans are following on DD Sports channel and satellite. Official numbers reported by the TV station itself range between 75 million and 105 million per day, depending on the length of the game. DD Sports has the exclusive TV rights and is reselling the signal and highlights to multiple TV channels, of which little statistics are available. Norway 500K – 1M: The TV coverage has over 20% penetration in the country. As the games are played during working hours, the simultaneous viewers number is not as high, but the total number of followers is significant. NRK, cited by Tarjei Svensen, reported that a total of 635 000 watched at least part of their TV coverage with expert IM Torstein Bae from 10:00 CET to 17:00 CET last Wednesday. On average, 180,000 followed the coverage. Norway online TV coverage 200K – 400K: Several videos on vgtv.no related to the match, with views from 200 000 to 400 000 and growing. Why is the viewership so high? A combination of factors have contributed to the massive interest in the FIDE World Chess Championship. As a basis, chess is the second most popular sport in the world according to an IOC study in 2005, with interest by 600M+ people (a study confirmed by YouGov http://www.fide.com/component/content/article/1-fide-news/6376-agon-releases-new-chess-player-statistics-from-yougov.html). The fact that a 5 time FIDE World Champion and legend in India is playing against an emerging young talent from the Western World that broke all records before the age of 22 has put a high duality in the encounter – clash of generations youth vs experience, a battle of the worlds East vs West, and a clash of styles traditional vs computer era chess are only a few to mention.